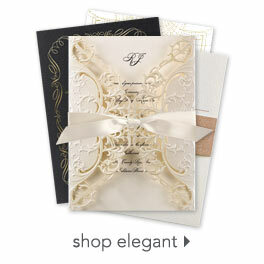 A border of deeply embossed swirls and filigree lends a deeply romantic feel to these ecru note cards. Your wording is printed in your choice of colors and lettering styles. Purchased these in the cream with raised lettering. Looks classy and pretty, definitely a statement maker card! Raised border design on paper edge is nice and elegant. More traditional type card but still makes an impression.